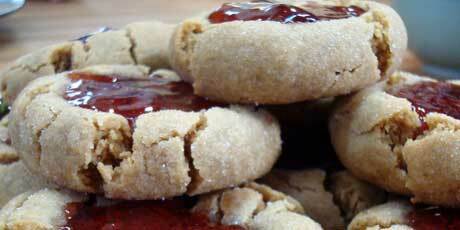 Two classic flavours come together in these tasty cookies from Michael Smith. 2. Whisk the flour, salt and baking soda together. In a separate bowl, whisk together the peanut butter, butter, brown sugar, egg and vanilla. Add the dry ingredients to the wet and stir together until smooth. Using a spoon, form 1-inch balls. Roll each in granulated white sugar then place on a baking tray. Bake for 5 minutes. 3. Gently push each cookie down with the back of a small spoon, flattening it and forming a small depression in the center. Fill the center with a small spoonful of your favourite jelly. Return to the oven and bake for another 10 minutes or so.